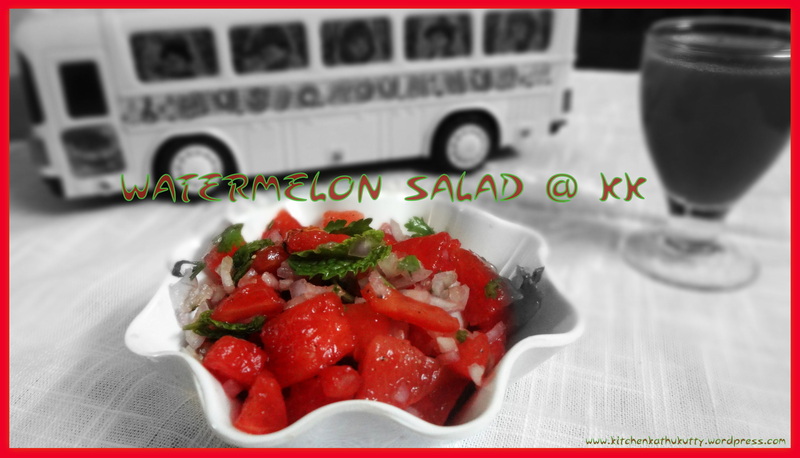 Watermelon is one the best and must have foods in this hot summer.This recipe is for babies above 6 months . Water melon is my life saver in summer. Since 3/4 th of the year the season is more likely to be summer in my place I prefer watery vegetables and fruits more. This idea of a fruit salad arose in me when few mothers wanted recipes of fruits for kids who dislike fruits because of the inherent sweetness of fruits. I tasted fruits spicy salad in a buffet at The Taj. I prefer sprouts salad for evening snacks than any other variety for the family. So I combined idea of salad with fruits. A delicious finger food for your baby,quick evening snack for your family and fussy toddler , an easy recipe of salad for a family gathering is here for you. 1.Mix all ingredients except lemon juice and stir well.2.Garnish with mint leaves and serve. P.S:The ratio of the ingredients is your choice.Do not add salt for babies below 1 year.I didn’t add chat masala.Adjust spices according to your taste.Always have a word with your doctor before introducing new foods. WATER MELON FOR BABIES:You can offer water melon to your babies after 6 months. Prefer to puree initially(recipe will be posted soon) and move on to this later. Few suggest to introduce melons around 8 months. Please don’t prefer juices for babies. To know why,please read here. Melons don’t contribute to allergies usually. How ever have a word with your pediatrician. many prefer juice for babies as this is a watery fruit. But preferring some pieces as finger foods or mashed pieces is highly recommended. I prefer water melons for babies because it is easy to pick and soft to eat. Remove the seeds carefully and then chop. Seeds might lead to choking in babies. This fruit will be a soothing option when babies are teething. 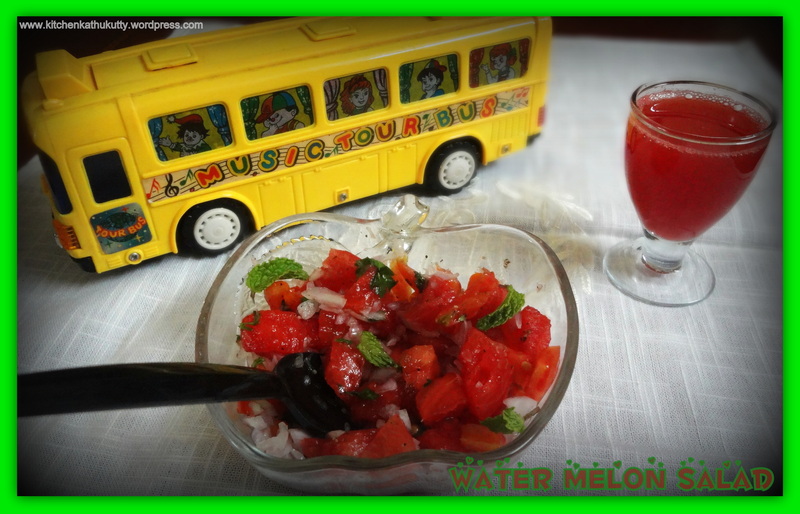 HOW TO CHOOSE WATER MELON? A melon which gives a good thump and hollow sound should be chosen.Always prefer fresh un-cut fruit.Inspect for bruises or cuts in the fruit.A fully grown melon will be heavier when compared to its size. The melon is 93% watery in content. It helps in hydration of your body.It is rich in Vitamin C and hence helps you in iron absorption,maintaining blood counts and boosting immunity.It is a source of Vitamin A which helps in your eye and skin health.Watermelon has calcium and manganese which helps in bone development and proper functioning of the nervous system.Water melon is known for the anti oxidant named lycophene which helps in preventing cancer,asthma and heart diseases.